Jackie O’s owner Art Oestrike teaching ELIP students about problem solving. If you’ve been in Athens for a while, you’ve probably heard of alum Art Oestrike, or at least visited one of his local businesses. What many probably don’t know is that this local entrepreneur and owner of the popular brewpub Jackie O’s as well as Bagel Street Deli is also an instructor in Ohio University’s English Language Improvement Program (ELIP), housed in the Department of Linguistics. ELIP is an “academic literacies for specific purposes” program that seeks to bridge the communication gaps between international and domestic students. Oestrike teaches ELIP 1300: Business Relations and Communication Skills, a project-based course that allows international and American students to work together as they solve problems and build their communication and presentation skills. This class is intended to teach key communication strategies to help students communicate effectively when working as a team. Oestrike earned a B.A. in Russian and an M.A. in Linguistics from the College of Arts & Sciences. He also earned a B.S. in Education from the Patton College of Education. For students in the College of Business, it can help them prepare for the Business Cluster, as well as for real-world situations. 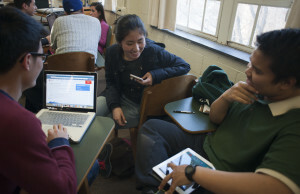 Students in other majors and colleges benefit from the class as well, as teamwork skills extend into nearly every field. 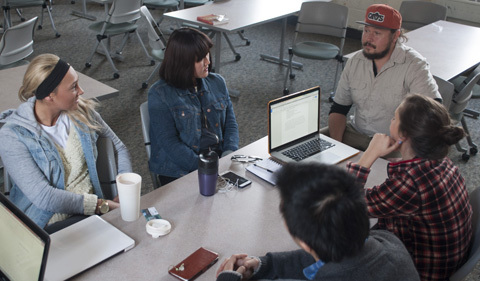 The course focuses on speaking in groups, working in intercultural teams, talking with business leaders, and giving presentations, as well as other skills intended to facilitate communication between international and American students, such as facilitating small talk and understanding different cultures. Students can benefit from the presentation and professionalism skills taught by one of Athens’ own top local businessmen. They are divided into small groups to work together to identify and find a solution to a real-life problem. For example, in Spring 2014-15, ELIP 1300 students worked with local non-profit groups with a global agenda. These hands-on projects provide a real-world context for the research, communication, and presentations that the students complete for the course. Eduardo, a chemical engineering student from Brazil, says that he took the class not because he was interested in business, but to meet students from other countries and the United States and to learn about effective communication. He says that he learned how to work in a diverse group and that everyone was able to learn from each other, not just about communication, but also about each others’ countries and cultures as well. As for taking a class with one of Athens most well-known “celebrities,” the students love working with Oestrike. “Art is a very good teacher. He’s very funny and teaches because he likes it,” Eduardo says. Other students mentioned the “chill” atmosphere of the class, where everyone feels comfortable and able to speak freely or ask questions without feeling the need to be overly formal. ELIP 1300 provides students from many different backgrounds, cultures, and first languages an opportunity to work together and learn from hands-on projects and from each other. The two credit hour ELIP 1300 course is available Spring Semester of the 2015-16 school year on Wednesdays from 5:15 to 7:05 p.m.